When I was in third grade I was a pudgy thing, with a body the shape of a barrel. It was 1970 and all those things we think of as being from the 1960s were just getting started in 1970. One of the things that was totally in were boots, go-go boots as we liked to call them. My mom, who didn’t tend to buy me extra pairs of shoes, finally listened to my pleas and bought me a pair of shiny black go go boots, with healsno less, made of only the finest vinyl I am sure. I loved those boots. I remember one of the girls in my class complementing me on them the first time I wore them to school. That was not something that had ever happened to me before. That may just be when my lifelong love of shoes began…. I loved to pair those boots with my fake leather mini dress with chain belt. Yes, we really knew how to rock clothes made from petroleum back in the day! It was brown, because it was trying to actually look like leather, and failing miserably. But when I had my go go boots on with my fake leather dress and its chain belt, gosh I felt like a nine-year-old version of hot stuff. The world was my oyster in that outfit! Oh how I wish I had a photo of my pudgy self rocking my mini and my boots . It the only outfit I really remember from my childhood, the perfect outfit that stands out in my mind. What photo of you do you wish you had? I was working on a story for my local history column in our local newspaper. It just so happens the story is about the great freeze of January 1913 that had a very damaging effect on the citrus industry in our area. The number of boxes of citrus shipped from our county plunged about 85% because of the 1913 freeze. Then I picked up the paper a couple of days ago and looked at the weather report. It said we could expect showers today and snow flurries tomorrow. Snow flurries??? WHAT??? But it is true, dear readers. A cold front has moved down from Canada that would normally go across the Rocky Mountain, and instead has moved much father south than usual. Today at 11:30 a.m. it was 52 degrees, according to my car. At 2:30 p,m, we had apparently gotten passed the “warm” part of the day and it was 46 degrees. As long as we keep the cloud cover we are good, but if the temperature stays down and we lose the clouds, we might get a hard freeze. Most of my tender plants are in pots and can be moved next to the house or indoors, but I am worried about my orange and lemon trees. The lemon tree is young and especially vulnerable. As long as it doesn’t stay below freezing for too long we are good. But I will be picking all the oranges on the outside of the tree tomorrow, as those are the most susceptible to frost. It is so weird, but I feel like I am living the story I wrote. The unusually cold day time temperatures, the worry about my citrus trees…it is 1913 all over again! Meanwhile I am enjoying my sweatshirt and jeans and warm socks, my hot tea, and my central heating. An those of you who live where you get a real winter can chuckle about those silly Southern Californians and their “cold” weather. What can I say, we have thin blood! Eldest Daughter was showing me some cute posters online. An artist had done adorable drawings of different breeds of dogs and grouped them on posters according to country of origin. Eldest showed me her favorite, the French dog poster. But something seemed to be missing. Where is the poodle? You know, the FRENCH poodle? Eldest poked around a bit until she finally found the FRENCH poodle. ”It must have originated in Germany. It’s on the German poster,” she said. Do you ever have one of those moments when your world goes slightly sideways? Well, discovering that the French Poodle, the fussiest of fussy dogs, is German, not French, really rocked my world. I had to Google it. Come to find out the poodle did originate in Germany as a water dog. The name “poodle” comes from a German word for puddle. Apparently the poodle was “standardized” in France, where it was also used as a water dog and became so associated with that country it became their national dog. The French national dog originated in Germany. Who would have thought? We knew we had to do something different this Christmas. We wanted to get out-of-town and have a complete change of pace. But we didn’t want to fly, we didn’t want to deal with snow and possible bad weather, and we couldn’t be gone too long as Hubby’s work is usually busy at the end of the year. After considering all these variables, we decided to go to Las Vegas! I was a little skeptical when Youngest Daughter suggested Sin City for Christmas. But I did a little research. One thing I was worried about was going somewhere for Christmas and then finding ourselves stuck in a hotel room, with no place to go and nothing to do on Christmas Day. Well, that was not something I had to worry about in Las Vegas. It truly is the city that never sleeps, even on Christmas. I checked and there were shows playing on both Christmas Eve and Christmas Day and I found out that all shops and malls connected to a casino would be open as well. 1. Lots of people come to Vegas at Christmas, many of them from foreign lands. 2. Most of these people want to eat at a buffet. We ate Christmas Eve dinner at the buffet at Treasure Island (AKA “TI”). We began waiting in line at 5 pm and were shown a table at 6 pm. We expected about an hour wait so it wasn’t too distressing for us, but we only wanted to do it once. If we had gotten in line a half hour later we probably would have had an hour and a half wait, as the lines get really long around 5:30 to 7, when most people want to eat dinner. 3. The Strip is crowded like Disneyland, but not necessarily decorated like Disneyland, for Christmas. Some casinos/hotels had lots of decorations, some had just a few. 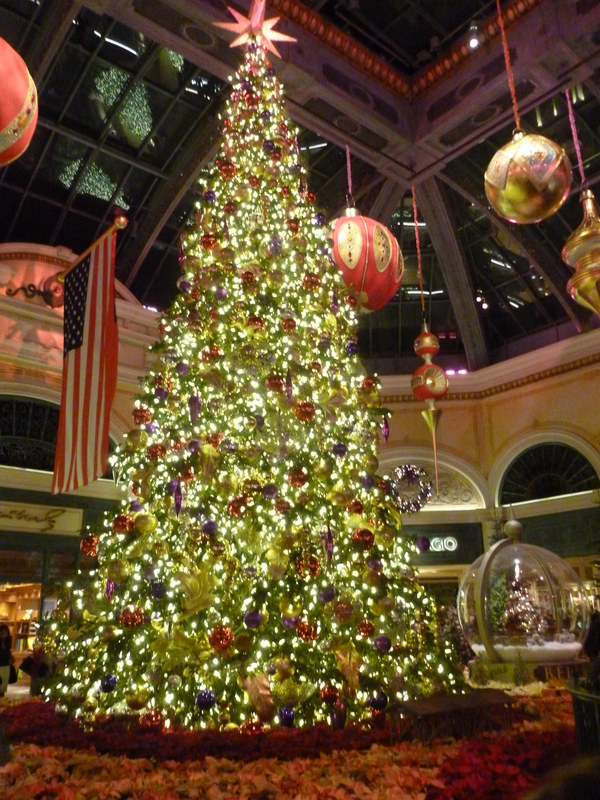 The Bellagio was beautiful, with the reception area, the shopping area, and the Conservatory all done up in an amazing way for Christmas. The decorations at Paris where we stayed were much more subdued. There was a tree in the reception area, some wreaths, and a little greenery on the light poles in the shopping area, all but the tree easy to miss. We got the impression that the hotels that seemed to cater to a more foreign crowd were less decorated. So Las Vegas, at least on the strip, is not exactly a winter wonderland. On the other hand, it is lit up like a Christmas tree 365 days a year, so how much more decorated can it get? 4. We went to see a production of “Jersey Boys” at Paris on Christmas night. It was fantastic and I highly recommend it. The theater was on the smaller side (for Las Vegas) and I don’t think there was a bad seat in the house. Eldest Daughter actually saw Jersey Boys on Broadway and she said the sets, the quality of the talent, and the energy of the show were just as good as on Broadway. 5. On Christmas Eve the four of us saw our first Cirque Du Soleil production, “Mystere” at TI. While the acrobatics were very good and interesting to watch, the costumes and “story” that ties it all together left us, well, “puzzled” may be the best word I can think of. We were puzzled by the large man dressed as a baby that had a prominent role in the show, the woman dressed a toddler in footie pajamas, the people in fantastic costumes who wandered on stage for a moment just for the heck of it (we guess) and the 25 foot snail with a human face that graced the end of the show. Watching Mystere was like analyzing a poem you kind of like but don’t want to dig too deeply into. All in all, the four of us decided we aren’t Cirque du Soleil people. However, there are numerous Cirque productions in Las Vegas, so obviously someone likes them. 6. Back to the Buffet. The buffet at TI was delicious. One of the food stations was called “Regional BBQ.” I have no idea what they meant by that, but I never visited any other food station, it was so good. They had sweet potatoes, collard greens, BBQ beans to die for, amazing mac and cheese, baked chicken, and ribs Hubby said were excellent. Dessert was good too, although I was so full at that point that I couldn’t enjoy it as I normally would. Then, Youngest saw a woman walk by with cotton candy. Eldest shoved me out of the booth and ran and got some. We finished that and then I ran and got some. It was a fun finish to an already yummy meal. 7. The Bellagio has an art gallery with rotating exhibits of famous paintings and other works of art. While we were in Vegas (and through May) the exhibit featured works of Faberge, jeweler to the Russian Tsars. We all like Faberge, especially the fantastic Easter Eggs the company produced for the Russian royal family. This exhibit included four eggs I had never seen in person. The ticket price was $17, less if you are a senior, military, teacher or student. So we had a little culture on Christmas Eve day. This Christmas trip to Las Vegas was exactly what we wanted it to be, a complete change of pace for our family. It was good. We enjoyed it. But I think we are all ready now for Christmas next year to be back at home. And that was the whole point! After Eldest Daughter was born her first Christmas was a nightmare. Too many things packed into one 12 hour day. I knew something had to change. 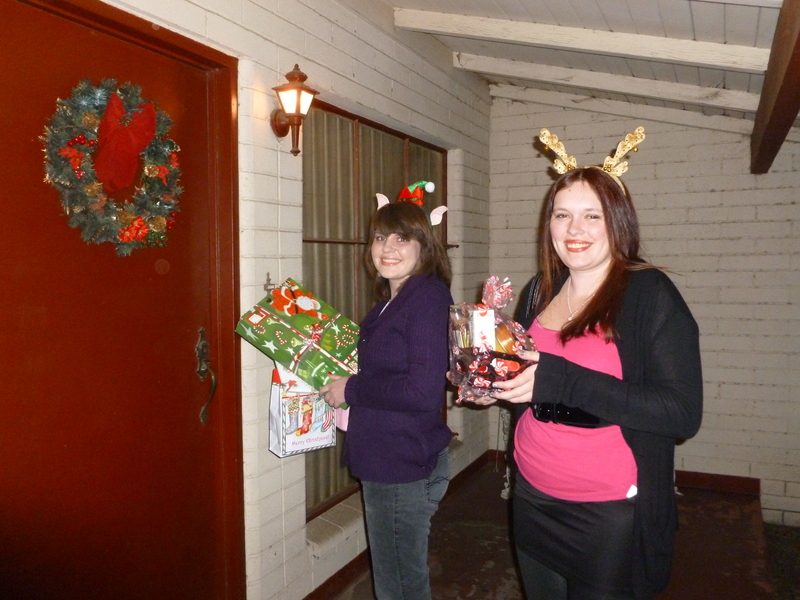 We approached Mom in Law: Would you like us to spend Christmas Eve at your house? Have us all to yourself? She loved the idea and a new tradition was born. Every Christmas Eve after that was spent opening ridiculous amounts of presents and eating lots of desserts. My daughters learned about the artful display of sweets on white doilies placed on pretty trays when they helped their grandmother get dessert ready. We all started the 24 hours of Christmas on a sugar high. Cheesecake! Carrot Cake! Milano Cookies! Brownies! Over the course of our Christmas Eves we started another new tradition: Silly Christmas headwear. Hubby would wear the traditional Santa hat but the girls and I would don some sort of silly head bopper. When Mom in Law opened the door and saw us there she always got a big smile of delight on her face. Standing at Grandmama’s door on a past Christmas Eve, the girls displaying silly Christmas headwear their mother purchased. From Christmas Eve a few years ago. 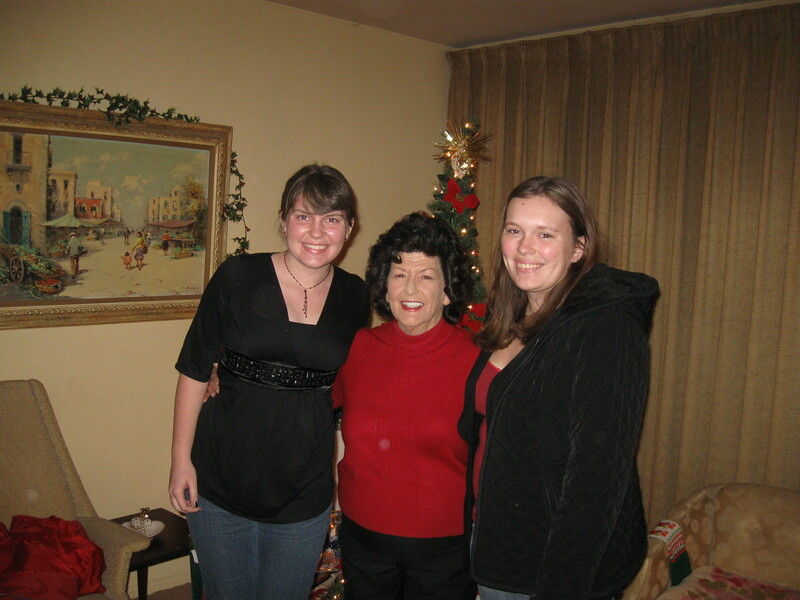 The girls had grown taller than their petite grandmother a long time before. This Christmas Eve and all the Christmas Eve’s going forward are going to be different. But we will always remember the Christmas Eves at Grandmama’s house. Money put in a Salvation Army kettle? Check! Christmas music program at church enjoyed? Check! About a 1000 Christmas songs listened to on the radio? Check! Attended two cookie exchanges? Check! Am I ready for Christmas? Check!!! I hope you have been able to check off most of your Christmas boxes as well and that you and yours have a very Merry Christmas! I will tell you all about ours in a few days! One of the first blogs I started reading on a regular basis a few years ago was Dooce, written by Heather Armstrong. Now, Dooce isn’t for every body. Heather has been known to use bad words. But, when she is talking about her kids and dogs, she can make me laugh a body part off. Take her recent post on December 17th. One of her kids has been sick with a virus, poor thing. For almost a week Heather was able to do virtually nothing but take care of her daughter. Meanwhile, one of her dogs decided to get sick, too. So while taking care of her very ill kid the dog is spewing things FROM BOTH ENDS all over her living room. While reading her take on the whole situation I laughed until I had tears running down my face. My kids are adults now but I had moments like that when they are little. I also have pets who still do awful things in my home. Like the time Honey pooped in the house and then danced in it and spread it absolutely EVERYWHERE. And that is why I laughed so hard. We have all dealt with it. We all survived, and Heather will, too. But, meanwhile, it is so funny when it happens to someone else! I love my daughters. When I was a little girl playing with dolls, I only wanted to grow up and be a mommy to girls. Lucky for me my wish came true, and I had two girls. I dressed them up and played with their hair just as I dreamed. But, in spite of this, sometimes I wish I had had boys. It isn’t why you think. It isn’t the eye rolling and the hair flipping. It is became sometimes, even in 2014, being a woman is just hard. No matter how many advancements we make, it is still a man’s world. I see that when men express surprise that Youngest Daughter is a mechanical engineer. I saw it when she had to deal with sexism in the workplace at her first and only internship. This is particularly on my mind as I write this because I was just voted off my city’s planning commission tonight. Originally, my fellow (all male) planning commissioners and I were given terms that coincided with the city council member who nominated us. Because we were a new city those terms were staggered at first. According to city ordinance, after that, planning commissioners would get four year terms. Then the city council, in an effort to get rid of another planning commissioner, decided on a crazy convoluted process whereby planning commissioners would be selected for four year terms but would be reconfirmed every year in December. Right before Christmas, oh goody! When that silly system was put into place, I knew it was just a matter of time. The city council person who nominated me thinks I do a good job and renominated me again tonight. People who actually attend planning commission meetings say I do a good job. They like the fact that I ask lots of questions of developers, hard questions. But three of the city council people decided I was not acceptable, including the one woman on the city council. A council member who was recently voted out of office (thank goodness!) told the chair of the commission that he “needed to get me under control,” that I had an issue with men, and that I was rude and disrespectful. Sounds like the same old sad story, doesn’t it? Strong woman needs to be controlled by a man. Forceful man is a strong leader. Forceful woman is a b****. And that is why I am, at this moment, feeling a little sorry I had girls. I hate that they have to go through what I have had to go through. But my girls were by my side when the vote went down. and they saw their mother hold her head up high in spite of the silly politics. Hubby was there too, and so many of my friends who know the real story. The funny thing is, the one woman council member used to follow this blog. She stopped following it less than a month ago. Guess I should have known then she didn’t want me on planning commission anymore. The kiss of death, and all that, like in a Godfather movie. So beware the one that stops following your blog. She may have other plans for you…. 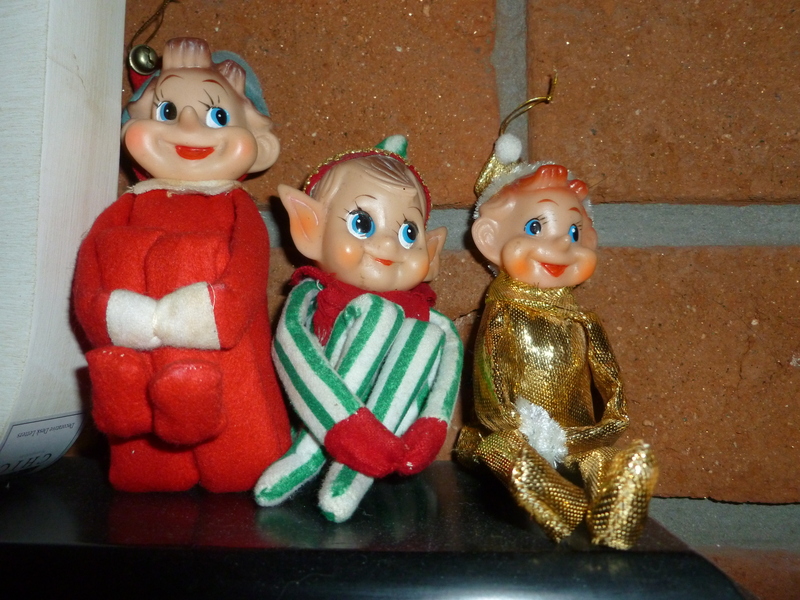 When I was growing up back in the dark ages, also known as the 1960s, part of the Christmas decor that my mother pulled out every year were a few little elves. They had cute little plastic faces and cloth bodies. Their little arms were sewn together at the ends so you could tuck their knees up under their arms. We had one with a red felt outfit, two other smaller ones dressed in shiny gold cloth and, my favorite, because it was mine, was wearing a green and white stripped suit. I loved those little elves and I always looked forward to their appearance at Christmas time. Here they are this year sitting on my mantle. Aren’t they adorable????? I eventually inherited my mother’s elves. Their cute little plastic faces so remind me of my childhood Christmases. Over the years I have added to my elf collection from various garage sales and thrift stores and I take great delight in putting them all out together on a table or mantle somewhere in the house. Midcentury Christmas decor at its best! My family doesn’t feel quite the same about my little elves. I noted that in all the Christmas stuff we found at Mom -in-laws, there wasn’t one little elf. This may explain why Hubby doesn’t have the same love for them. But my daughters? One, who shall remain nameless, thinks they are “creepy.” I find this quite distressing and blame that dratted “Elf on the Shelf.” In case you do not know, “Elf on the Shelf” is a book that comes with an elf that looks a lot like my elf with the red suit. The book is about the “scout elf” who keeps an eye on children and reports back to Santa about who is naughty and who is nice. It is a way to keep your kids in line during December. I feel like this book has turned my delightful little elves into tattletales and narcs. I bowed to pressure and didn’t put them out last year. But, this year, I said to heck with it and put three of my little guys out in my den. I think they are just having a good time. I don’t think they are reporting on us to anybody. Take that, Elf on the Shelf! May your holidays live long and prosper! This is a year when we look back at holidays past with love and fondness, but also look forward to thinking about new holiday traditions. It would have been nice if we had been able to do that over time, transitioning from one set of traditions to another. Unfortunately, that isn’t the way it worked out, so we are figuring it out on the fly, so to speak! I have many many Christmas ornaments and most have lovely memories attached to them. 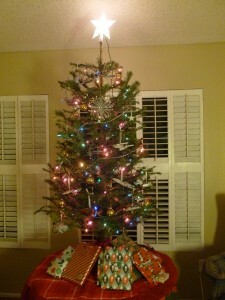 As such, I have never been one to do a theme tree. I always admire the ones I see, but can’t bring myself to relegating the old favorites to staying in the box. But as I said, it is a time for figuring out new traditions, so this year is our first themed tree in 28 years of marriage. As I mentioned in my last post, it will be a Star Trek tree, which is making Eldest Daughter and Hubby very happy. Youngest and I are good with it as well, although not quite as excited as they are. One of the reasons I have never done themed trees is the great expense. I can’t imagine buying a whole new tree full of stuff every year. However, for the Star Trek tree, we are using stuff we already have, with the exception of one new ornament, which cost me less than four dollars. 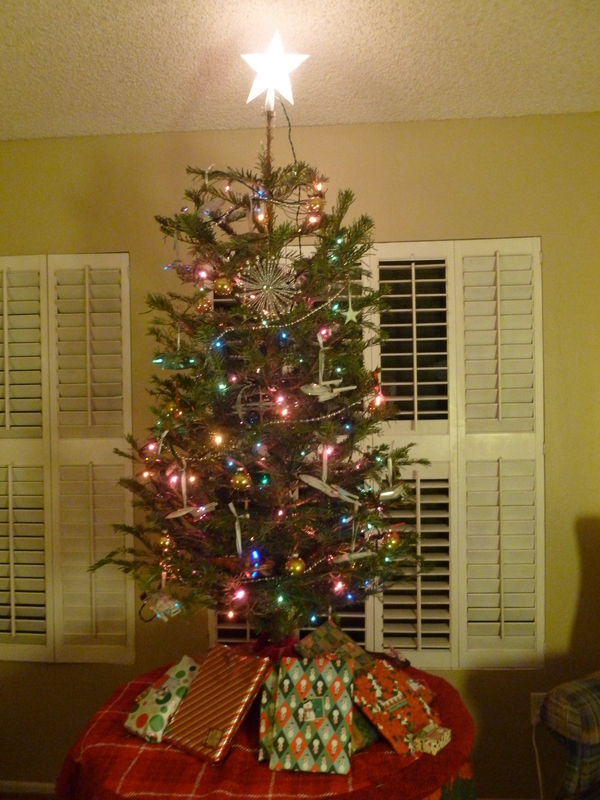 Here is our little tree in all its nerdy glory. We had to pull out our old set of lights so we could plug in all the Hallmark ornaments, some of which date to the 1990s. The girls were amused by the ones that say things. One has Spock saying “Spock here. Happy Holidays. Live long and prosper.” Another has Worf (who is a Klingon) saying ” I wish you a most honorable holiday.” Even better, when I plug the tree in at dark, all of them start speaking at once. It gives me a chuckle every time. 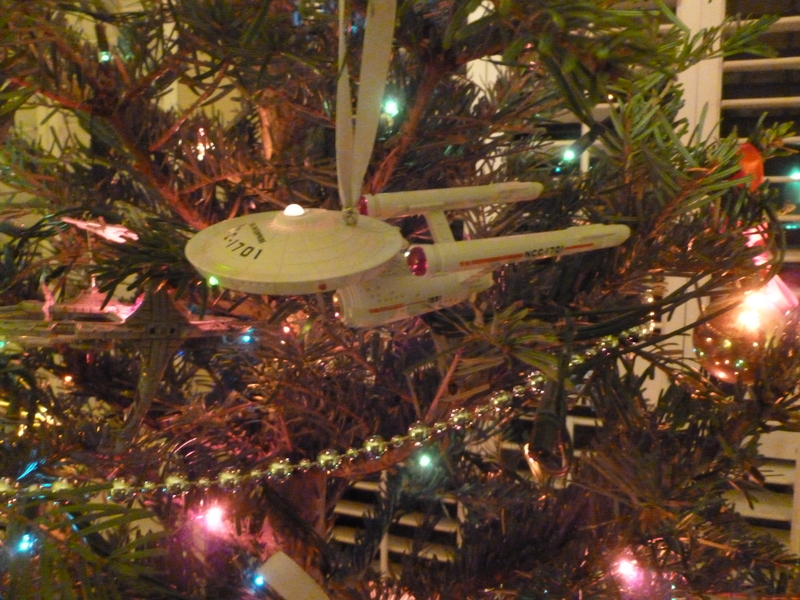 Nothing says Christmas like the Enterprise, right? In addition to the fleet of spaceships, we added a string of silver beads, a few small gold balls, and the white star which has a bit of blue sparkle on it, which isn’t showing up in the photo. 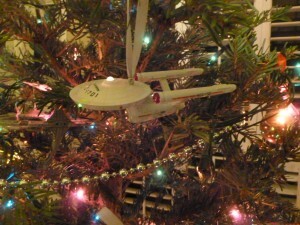 It has been fun planning and decorating our Star Trek tree this year. Like I said, time for new ideas around the holidays!